Effortil is a reliable oral circulatory analeptic with a stimulant effect on the cardiovascular system. It raises low blood pressure to normal, improves cardiac performance, reduces the circulation time, and increases the quantity of circulating blood. Pulse rate remains u’nchanged. 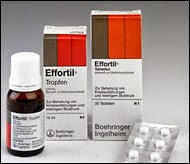 Effortil is well tolerated by patients of any age; its efficacy is reliable regardless of the mode of administration. collapse associated with the dumping syndrome, oversensitivity to weather.